Want to surprise the kids? This swing kit has all the swings and accessories for guaranteed fun! 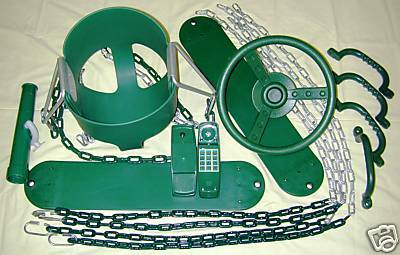 A complete fun kit combined with 2 belt swings and 1 infant swing. By combining everything in one kit it is priced to sell! Infant Swing Accessory Kit DLX What a Value! All this for one low price of $149.95! Swing Kit - 3 Position - A great combination of items if you’re looking to fill up space on a swing set with swing set swings! This kit includes two belt swings, and a trapeze bar with rings. All swings include plastisol coated chain that nearly eliminates the finger pinching factor along with greatly extending the life of your swings! All for only $89.95!! $110 if sold separately!